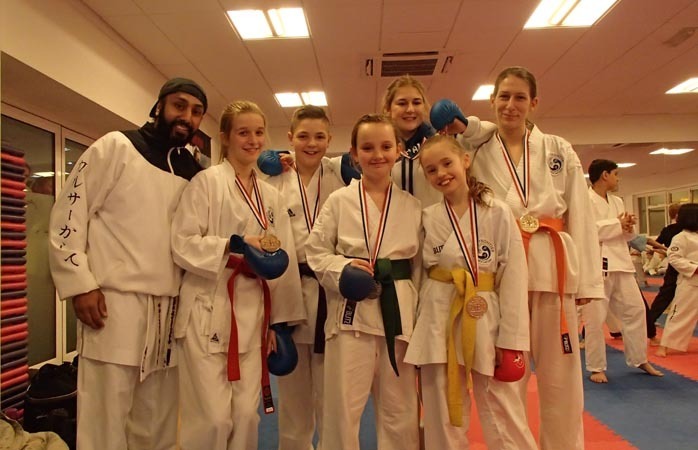 Seven members from the Khalsa Karate Club based at YMCA Hawker in North Kingston took part in the English Karate Championships on the weekend of 24th-25th January. Florence Bradley (aged 9); Rachel Eagleton (12); Fran Hardcastle (16) and Katie Maycock all won gold medals. Ciara Gray took home a silver medal and Alex James won one individual bronze medal and also secured a team bronze for the club alongside Rachel Eagleton. Also representing the club in the Championship were Jack McGrath (aged 12) and Jenna Cato (10). This weekend, 16 year old Fran Hardcastle will go on to take part in this year’s EKF European Karate Championships for Juniors and U21 in Switzerland. She will be fighting for England and defending her bronze title from last year’s Championships in Portugal. Satinder Sehra, leader of the Khalsa Karate club, says he is incredibly proud of the team’s efforts in the English Championships. “The fantastic results are due to the hard work everyone has put in at training, but also the lovely atmosphere of the club. Everyone’s really supportive of each other and it’s just a great community atmosphere here at YMCA Hawker. Among the members, there’s very much a mentality of ‘giving back’ and adult members do so by volunteering as trainers for the younger members”. The last years, the club has done really well in the English Championships. At the moment, there are six English Champions among the members and the club has a large competition squad who take part in competitions regularly and who train two to three times a week. Satinder started Khalsa Karate over 20 years ago. The club has been based at YMCA Hawker since 2001 and now stretches across the whole of North Kingston, including Tiffin Girls School, Grey Court School, Fern Hill Primary School and St Richard’s Primary School. “I opened my own Karate club at YMCA Hawker on 10th September 2001 and started with 3 students. I now have in the region of over 300 students and in September we will be opening the newest branch of the club at Kingston Academy. We are always open to new members and if people want to register their interest, they can get in touch with me or call in at YMCA Hawker”. “I believe the reason Karate has become so popular in Kingston is because our members have a lot of fun!” says Satinder. “At training, we let the children have a ‘go’ at the adults, and they love that. But karate is not an aggressive sport, rather it is great for everyone wanting to learn about respect and discipline. It can also help you feel more confident in many situations, and I think that’s why so many of the members are women. Satinder also believes karate can teach young people valuable leadership skills. “We let the 16-17 year olds teach and mentor the younger members, that way they learn to be responsible and good role models”.